When was the last time you felt scared at the theater? Not disturbed or perturbed or provoked, but scared? 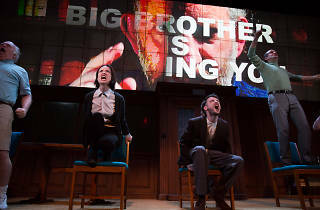 The harrowing climactic torture scene of 1984, adapted from George Orwell’s novel by directors Robert Icke and Duncan Macmillan, is intense in a way I’ve never seen on Broadway: It’s gut-churning. Children under 13 have been barred from the production; even adults may shake in their seats, or at least avert their eyes. This gripping show rewards watching, though, and not just in that visit to Room 101 at the grotesquely named Ministry of Love. Orwell’s vision of a surveillance state awash in groupthink and propaganda was published in 1949 and set in 1984, but it remains uncannily suggestive of the present and the future. Winston (the remarkable Tom Sturridge) is a minor functionary in the fake-news department of the government of Oceania, erasing all traces of those who have run afoul of the country’s repressive and possibly apocryphal leader, Big Brother. His qualms—spurred by lust for fellow “thought criminal” Julia (Olivia Wilde, a hard-edged cipher)—lead him to a terrorist movement linked to a high-level official named O’Brien (Reed Birney, masterfully unflappable). When Winston and Julia meet for offstage trysts at an antique shop—supposedly unseen by Big Brother’s ever-watchful eye—we see them on a giant video screen, as though they were being captured by cameras they didn’t know existed. As technology becomes more pervasive and ideology more rigid, it is hard to resist drawing associations between Orwell’s horror story and the way we live now. But be warned: 1984 is spikier than you might remember from reading it in high school (or claiming you had). 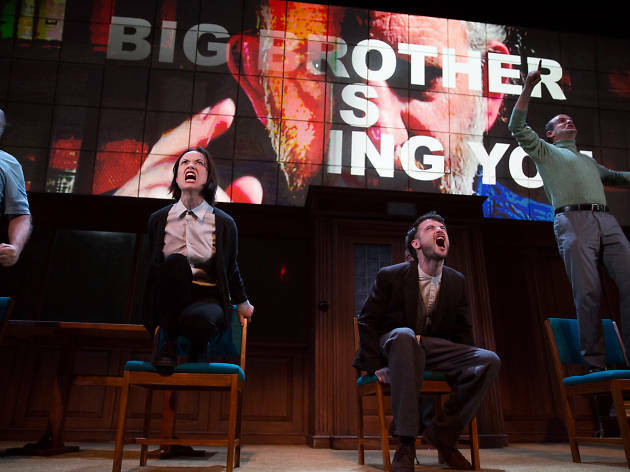 Is Big Brother a despot of the right or the left? Is the resistance as virtuous as it thinks it is? What makes this antipropaganda broadside so lastingly compelling is how successfully it resists decaying into propaganda itself. Hudson Theatre (Broadway). Written and directed by Robert Icke and Duncan Macmillan. With Tom Sturridge, Olivia Wilde, Reed Birney. Running time: 1hr 40mins. No intermission. Through Oct 8. 1984 is based on the novel of the same name and is eerily relevant of what's happening currently considering it was written in 1949 about public surveillance and public manipulation by wiping out the existence of your record. Literally your existence. What a scary though then and it is now.There is a leader called Big Brother who watches everything you do and this book is the reason why that reality show exists. The government is watching you. The production of this play is spectacular with the buzzing lights and violent noises which made my heart race. It is filled with much exposition in the beginning but doesn't really bog down the audience by giving all the information. It is provided in dose thought there are moments that drag towards the middle before the climatic torture scene. I wasn't in the front but watching it was brutal even though you know it isn't real. Honestly, it's not for the faint of heart and even if you think you can tolerate it, it is still an intense experience to watch. The actors do a great job showcasing the characters with the amazing Tom Sturridge anchoring the cast with his rebellious Winston Smith. Happy watching and remember: Don't deny, satisfy!